10) The greatest living golf legends agree that Rory McIlroy is the most brilliant new star on the links these days. If you don’t believe them, see Google. 9) President Barack Obama wishes that winning over his recent golf buddy Rep. John Boehner and the Republican Congress would have been as easy as Roarin’ Rory’s US Open win at the Congressional golf course. 8) President Assad of Syria wanted to send his congratulations to Rory McIlroy on his US Open win, but he got distracted ordering more mass murders of his own subjects and giving another windbag speech. 7) Now that an Irish player has won the US Open two years in a row, can America afford to ignore the PIGS and Euro crisis? 6) Muamar Gadaffy has invited Rory McIlroy to play a showcase game of golf in Libya, boasting that his green nation is now a giant golf course with the most and biggest holes, built by the leading Western powers. 5) Unfortunately for Northern Ireland, the money that Rory McIlroy won at the US Open still won’t be enough to fix their economy. 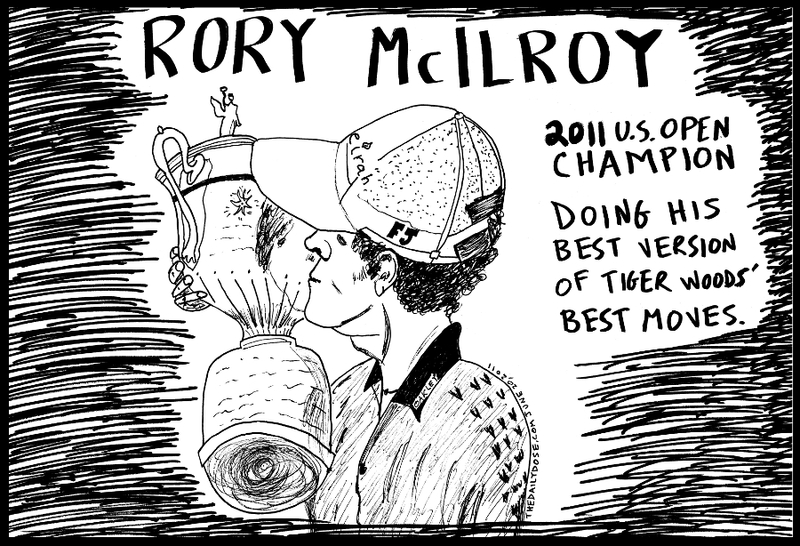 4) Rory McIlroy proved that even in the era of Tiger Woods and President Barack Obama, a middle class white boy from Great Britain can rise up to become a golf champion. 3) Dubai company Jumeirah Hotels &amp; Resorts, which sponsors Rory McIlroy, thinks he will perform even better if he plays in a Jalabiya. 2) Against all odds, 22 year old Rory McIlroy won the US Open with better shooting records than Tiger Woods during his best days, but he still hasn’t put more balls into more holes than the iconic American player. 1) Rory McIlroy would be even happier to take over Tiger Woods as the greatest player in golf, if it included a copy of Tiger’s little black book.